Look around you: Newspapers, Television News Channels & Entertainment Networks, Twitter, Facebook, every possible social and mass media platform online and offline is talking about only one thing in a unanimous voice. 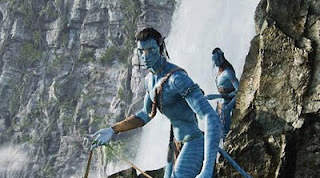 That is, how awesome ‘Avatar’ the 3D movie, rather the experience is. It is a foregone conclusion by now that at this stage no review or reviewer can influence the fate of this movie. Irrespective of what any reviewer writes, this movie will have its audience, followers, devotees all whom want to experience a slice of history. The so-called intellectual elite when it comes to movies, the movie critics, for the first time seem totally irrelevant and outdated compared to what James Cameron has achieved with this one movie. This film is critic proof. Am sure most reviewers must have been stumped totally by not knowing what to write after they saw the movie, because it isn’t easy to comprehend what one has witnessed on screen. It’s like someone landing on the Moon and looking for street signs or a map to move around. There isn’t any map that exists. So in the same vein there needs to be a new language, new words that need to be invented to review a movie of such magnitude and technological advancement. I doubt if most people who watched this movie really know what is so special about this film. I will try to put some things in perspective here so that all this makes some logical sense. In addition, I will also attempt to deal with the all-important question on everyone’s mind: Is this film going to change the way films are made from now on? That is what everyone has been hearing. The answer from me is both a part YES and a part NO. Are you puzzled? I will make my analysis of the movie and its impact a little simpler for everyone by asking a few questions which I shall also try to answer. In trying to answer this, I hope you can figure out if this movie will really change the future of cinema. Question: So what makes Avatar so special? Is it the 3D technology, which lets you get immersed into the screen and become a part of the action? Is it the totally believable CG characters that emote as well as human beings and have more acting time on screen than the real life characters? Is it the creation of the new world Pandora? A world that is built from scratch and is spectacularly breathtaking to look at? Is it the amazing battle and action sequences that make the movie special? Is it the story that has connotations and relevance to happenings of our real world that make this movie so identifiable to us though set in another planet and in the distant future? Would it work well enough if it were to be made only in the regular 2D format? Needless to say, all the above points contribute to the movies imminent success. Let us now deal with each point in detail and understand why it is so important and special. 3D films have been around for quite some time and was quite a rage in the 1950’s in the US and there have been many attempts to use it for regular mainstream films but with very little success. There have been few very good IMAX 3D documentaries one of them I can recall named BUGS that had amazing visual depth and realism. Also in recent times, there have been movies like Polar Express and Beowulf, which pushed the boundaries further. Both being totally animated fares subsequently starting the trend of every CG film in the making now going to be a 3D film. There are no more CG films being made in 2D format, when I say 2D I mean the ones we see without glasses. So with regards to this it’s nothing groundbreaking about Avatar or so you might think. Earlier attempts at 3D in live action movies at best have been clumsy affairs, and rarely employed for the entire duration of the movie. For Superman Returns and Harry Potter 6 certain portions were in 3D. The results were not impressive, the characters looked like cardboards, and it didn’t involve the viewer into the action and relied more on gimmicks. This is where Avatar succeeds big time over both the live action as well as the CG movie attempts that were made until now. It takes the audience into the world that is on screen. It’s totally unobtrusive and there is no strain on the eye. The colours are rich and there is believable depth in the scenery all of which were never right in the earlier movies. So this is definitely a first and will set the trend for many more big budget flicks that will arrive in future. Is it a game changer? 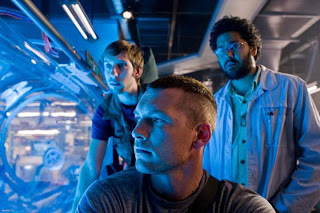 - Yes, already the number of 3D screens worldwide is being ramped up due to this movie. After many years you now hear of advance bookings for a movie with waiting periods upto a month. Unheard of and unimaginable till recently and once the norm earlier. So it is sure to revive the magic of viewing movies at the cinema once again. Totally believable computer generated characters that can emote naturally have been the holy grail of every animation and visual effects enthusiast for many years now. There have been lot of unsuccessful attempts and the technology took a lot of time to develop, probably explains why James Cameron had to wait for 14 yrs to make his epic. The first signs of a fully believable CG character were that of Gollum in the ‘Lord of the rings’ trilogy. That set the ball rolling for further development and with Avatar the process has come a full circle. I will not dwell deeper into the technology used but will talk about the impact it has rather than the process employed. The inhabitants of Pandora, Navi are all computer generated. They carry the whole film on their shoulders, no mean achievement. They emote so well that you forget that they are not real characters. The detailing is unbelievable and every single Navi and the various other creatures are so well designed, and animated with extreme fluidity, not giving even one chance for the audience to suspect that they are watching a CG world. The emotions in the main protagonist, his every feeling has been captured beautifully. What is noteworthy is that he has created a female protagonist who isn’t human yet so beautiful and sensual that you fall in love with her. I don’t think you can compare anything else to that feeling. Is it a game changer? - Yes, and a dangerous and big Yes for a future where we finally see an actor who looks human but is entirely computer generated. The days of the star actor might get over. The animator will become the real hero. A digital star might never age and no one has to deal with his or her ego’s anymore. This might change the dynamics and style of filmmaking. Again, I say this with some caution as this style might not be a rule or a norm for all kinds of films, but has dangerous potential to rewrite many rules of big budget feature film making. 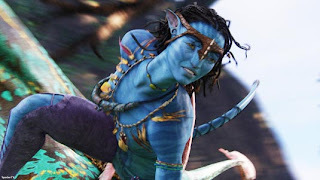 Pandora, a magical world envisioned by the master creator James Cameron. Every single thing you see on this planet is computer generated. And is at the same time an original creation, it’s almost like James Cameron one day decided to wake up and play god. And yes, indeed he is god here, because what he has created is so breathtaking that one has never seen anything as spectacularly beautiful ever on screen or in real life. The rich landscape of Pandora is filled with flora and fauna that is so intricately designed that it puts to shame the creations on earth. Makes you feel like Camaron has decided to compete with God, can you beat that? This according to me is the single most spectacularly appealing thing about the movie apart from the characters. Is it a game changer? - NO, Highly unlikely that we might ever witness something as spectacular as this world. It’s like a modern day masterpiece of our digital age, something which can’t be replicated ala a ‘Monalisa’ by Davinci. Many might try to imitate but I doubt if any story would require a world like this, and if required, would be able to create a similar impact. This is a onetime phenomenon created for posterity. Action and sense of adventure is the staple diet based on which many blockbuster movies have been made. They make the most compelling pieces of cinema. Be it Ben Hur, Mackennas Gold, Starwars, Indiana Jones, Rambo, Jurassic Park, Matrix, Gladiator, Lord of the Rings, Harry Potter or a Transformers, they all have terrific action adventure sequences which are talked about till today and ensure repeat audiences. Nothing compares to the adrenalin rush of watching a good fight or a battle. That’s what big screen movie magic is all about, mind blowing action. 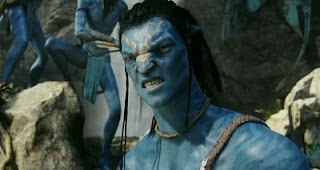 When it comes to Avatar, its wouldn’t be an anomaly to state that it has the best action that one would have ever witnessed on screen. Carefully look at all the names of the great movies I mentioned above, if you have already seen the movie try to think of each of the above movies and see where Avatar has bettered each one of them. In case you haven’t seen it yet, let me assure you, you will find the action a combination from all the above movies and more. You can’t ask for anything better and bigger than this, sure shot blockbuster material. Is it a game changer? - NO, again a onetime phenomenon. Don’t expect to see the variety and scale of action again in one film. All other things being equal, what ultimately matters is whether one has a compelling story to tell. No amount of visual effects wizardry can save a movie without a good story to tell. We have countless examples of big budget duds. 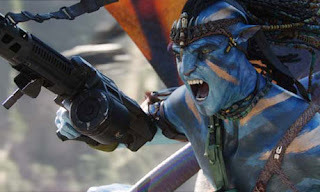 On the one hand James Cameron has the budget he requires to make his visual effects extravaganza which is in the upwards of $300million plus which can get to any creative persons head to lose all track of logic yet he weaves a simple yet highly effective and emotional story never loosing the grip on the pulse of the audience. The story is simple yet has a very strong message and addresses a global concern, which is the need of the hour. A futuristic story, yet has its soul intact and rooted to ground reality. In terms of complexity of story, James Cameron’s earlier movie ‘Titanic’ had a far more complex plot. There he had to tell a story of a Sinking Ship where most people die in the end, including the main protagonist who doesn’t get to save the world or the ship or anything like that, nothing heroic, yet he is able to create an instant hero out of the circumstances and also tell a compelling love story. Here the challenge isn’t that great. The setup is simple, nothing complex in the narrative, maybe deliberately planned that way so as not to interfere with the other happenings on screen in terms of visual appeal. It still works at its basic level and the audience can feel for the characters on screen. Nothing groundbreaking as far as story goes but for the relevance of the story for today and tomorrows generation, yes, this story had to be told, and told soon. James Cameron accomplishes it very well. Is it a game changer? - NO, story is no doubt relevant to today’s world but will not have much change in the movies we make. Maybe it will sensitize few people to the perils of warfare on a foreign soil. That is all at the most. 6. Last question : Would it have worked as well if it were just another 2D format movie? Would the movie still work if it were not made in 3D. After reading the above few points what do you think? Of course, it would still be the blockbuster it is with so many positive things going in its favour. The 3D experience just enhances it many notches above what it would have been as a normal 2D experience. That makes the movie almost unreachable and unthinkable for any other filmmaker to even aspire to surpass it or leave alone matching it sometime in the near future. Finally, that sums up my interpretation of the Avatar Experience. Most of you who have already seen the film might see some sense from what i have tried to decode and for those of you who haven't seen it yet, you know what to expect. Go and experience it yourself. Its a once in a lifetime phenomenon.